Definition at line 21 of file ConnMark.h. Definition at line 65 of file ConnMark.cc. Definition at line 20 of file ConnMark.cc. Definition at line 42 of file ConnMark.cc. 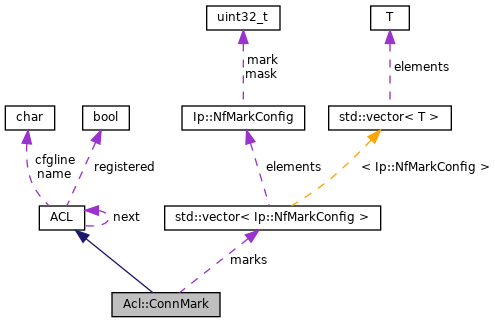 References asHex(), conn, debugs, Filled(), and marks. Definition at line 26 of file ConnMark.cc. References debugs, marks, Ip::NfMarkConfig::Parse(), ConfigParser::strtokFile(), TexcHere, ToSBuf(), and typeString(). Definition at line 75 of file ConnMark.cc. Definition at line 34 of file ConnMark.h. Referenced by dump(), match(), and parse().